Eagle Crest Assisted Living: Pricing Information. With our convenient all inclusive monthly plan we offer certified 24 hour a day 7 day a week staff, 3 nutritious home-cooked meals daily, snacks, housekeeping, activities, medication assistance, assitance with bathing, dressing, grooming, access to the recreation center (62+ get in free). 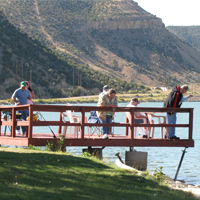 Our monthly rates are among the most affordable in Western Colorado. We work with the Veterans aid and attandance program and medicaid that also help with the monthly cost. Being close proximity to the hospital, doctor offices, and physical therapy offices, our staff is happy to make and transport residents to and from appointments. Eagle Crest is also a well involved with lots of activities and outings that are sponsored by the senoir center. Our residents also have use of the senior bus that takes them on outings, shopping, doctor appointments in Grand Junction and Vernal once a month. or if you would like to schedule your personal tour and complimentary lunch. The monthly price includes all the amenities, meals, lights, gas, snacks, 24 hour staff, transportation to all local appointments, ETC. All prices are for private studio room with a private bathroom with handicap accessible showers.